After a stellar first issue of MST3K the comic, issue #2 came back down to Earth a little. What worked really well in the first issue - i.e. the running commentary over the old-time comic - was unfortunately a little hit and miss in this issue. Jumping off of the last issue, we find part of our main cast, this time Jonah and Crow, bandying about between an issue of Black Cat (from the Golden Age) and an issue of Horrific all while getting interstitial with Kinga plotting. First, the interstitial, or host segments, continue to be some of the biggest highlights of this comic. The interplay between Kinga and her minions is funny and keeps the absurdity of the plot moving along - exactly like in the TV show. Couple that with the hilarious “in-comic” ad, and the character of Kinga truly steals the show in this issue. For the comics themselves that get made fun of, the one involving Black Cat unfortunately doesn’t really work while Horrific does. The tricky part of translating MST3K to comics was always going to be capturing the voice of Jonah and the robots as the action plays out. In Black Cat, I noticed that, for some reason, there was barely in-comic dialogue and that most of the dialogue bubbles were saved for the jokes. So, an already paper-thin plot that is happening in the comic, becomes even thinner since there is barely anything to actually make fun of. On the other hand, in Horrific, there was a nice balance between the jokes and the dialogue throughout the issue which worked so much better. This month, the in-comic art is left to Jack Pollock and he does a marvellous job of capturing the look and feel of 1940s and 50s era comics. His Black Cat especially looks to be taken right out of her comics from back then. 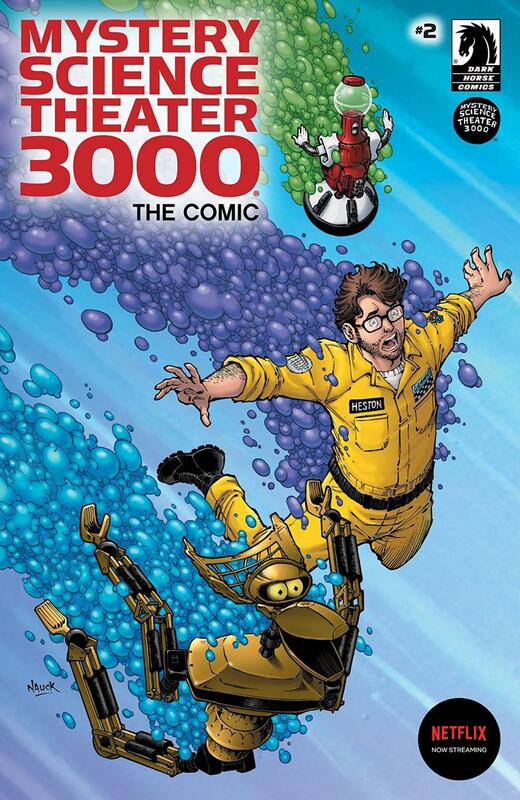 Though it was a slight step down this month, MST3K continues to be a really fun comic to read and I’m hoping that issue 3 delivers.